The Pearl Technology contained in every TheraPearl pack is game changing innovation born of an age old therapy. Crafted by a doctor who knew she could offer her patients something better than a bag of frozen peas, TheraPearl was designed with you in mind. Whether chilled or heated, Pearl Technology™ conveniently holds its temperature for the doctor recommended time of 20 minutes and conforms to your body to deliver the perfect relief from your aches and pains. Easily pliable when frozen, our Pearl Technology™ is cold enough to offer targeted ice therapy without sacrificing flexibility. Not stiff, jagged or uncomfortable, chilled TheraPearl packs stay smooth and soft on your skin as they conform to deliver soothing relief. When conveniently heated in a microwave, the Pearl Technology™ in your TheraPearl pack is the perfect solution to relax stiff muscles and encourage blood flow and healing. Delivering consistent heat therapy directly to your desired relief area without a mess, the reusable packs are combination therapy in one convenient product. (Read More) . Candice gave me the option to choose what product I wanted to review, at first seeing the wide selection of products THERA○PEARL has to offer, I was in wow.. I wasn't really sure what I wanted to review. They offer up such great Products such as the back wrap , pink sports pack (love) and the pink eye mask (also love) and THERA○PEARL also has a cute selction of hot/cold pads for kids and they are so adorable! Ribbit the frog, Pearl the pig, Buddy the puppy, and Ping the panda. 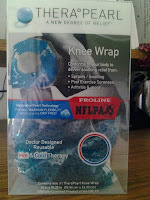 but as soon as I seen the knee wrap ($19.99) I knew that is what I wanted to review. My husband (37) has 2 bad knee's, one worse than the other, but both give him problems, often when you does strenuous work, or extra walking. He some times gets off work, and just falls face first into bed, because his knee's hurt so bad, that he doesn't want to walk. I offten find myself doing everything possible from rubbing him down with deep-heat, to ice packs, to running him a super hot bath to soak in. I know he is always in pain, and I feel sorry for him and wish I could do something. All the things I do to make the pain go away doesn't always work. We have invested in other products that are for pain relief such as hot pads, cold pads, knee braces, different types of creams, EXPENSIVE products simular to the THERA○PEARL knee wrap that never worked and was a waste of money, or ended up causing him more pain then what we started out with at first. My husband has used the heck out of the knee wrap. He loves it. He said it's the best thing that he has used for his knee relief.. EVER. He loves everything about it. We both love the fact that it is a hot/cold wrap. Meaning we can freeze it, or heat it for whatever needed for it's use for that time of use. I have used it a few times and love it as well. I fell down on the stairs going to check the mail when it was raining and slippery, and banged my knee pretty good. I tried every cream we own, and nothing worked. The creams wasn't getting down to the deep muscle to relieve the pain, until I used the knee wrap. Within a few minutes of putting the wrap on, I could feel a difference in the pain, the swelling went down pretty quick also. My husband and I have bought what is simular to the THERA○PEARL before, one that is used for heating, and one that is used for freezing. It was a waste of money to buy 2 expensive products when the THERA○PEARL is a 2-in-1 product. The previous heating pearls ending up busting and we ended up having to throw away the gooey mess, which was a waste and plus the loss of the money we spent buying it. The freezer pack never worked, no matter how cold we got it, we never felt a difference. One of many things I love about the THERA○PEARL is that the knee pack is clear. You can see all the little pearls. Which gives a unique twist to a hot/cold pack, and it also helps to see that the pearls are in good condition. I love mushing the pearls around. I guess I'm a kid at heart. Besides the obvious (that the THERA○PEARL is straight out amazing!) 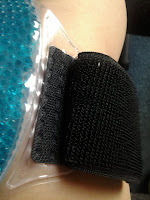 I love that the knee wrap is adjustable. I lost count as to how many knee braces, packs, ect. we had to take back to the store because they were not adjustable. My husband is 6'4 and BUILT. I'm 5'5 and adverage height and build, the products would fit me perfect, but they would cut into his skin because they were so tight. I would feel so horrible that he would be in so much pain, and we would have to go store to store to find a product that would fit his big, muscular legs and the stores wouldn't carry a product in his size, or they would be all out. I know it made him feel horrible because he is built so big, and then couldn't find a knee brace to fit him. The THERA○PEARL knee brace not only is adjustable but the adjustable band also stretches really far out for a better fit. Way to go THERA○PEARL! ♥ You can find THERA○PEARL on Facebook - Here. ♥ You can find THERA○PEARL on Twitter - Here. ♥ I receive no monetary compensation for this review. 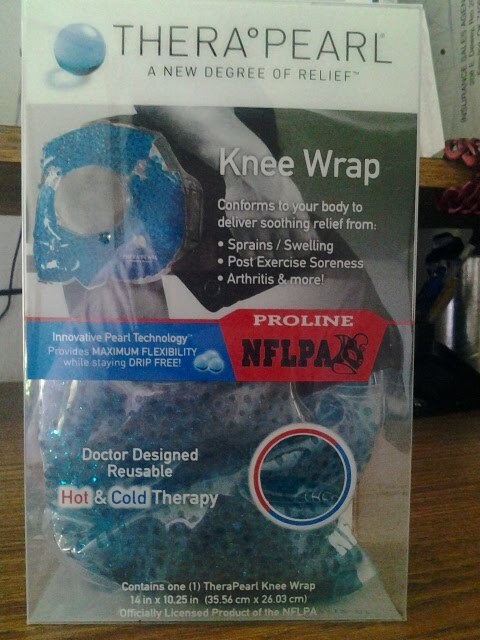 I was provided a knee wrap to try and give my honest opinion.